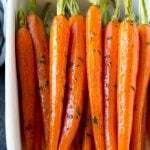 This recipe for honey roasted carrots is whole carrots, bathed in honey and seasonings, then roasted over high heat until tender and caramelized. A super easy yet elegant side dish! I always have a bag of carrots in my fridge, they’re inexpensive, last for weeks and my kids will always eat them! These roasted carrots take just minutes to put together, but are fancy enough to serve for company. In my opinion, the best way to eat vegetables is when they’re roasted. After a trip through the oven, most veggies get browned and caramelized and their flavor intensifies in the best possible way! These honey roasted carrots are my all time favorite way to eat carrots. In fact, my whole family devours them, even the kids! Making this recipe is quite simple and only requires a handful of ingredients. Given that the ingredient list is so short, I try to get the best quality ingredients I can find to make these honey roasted carrots extra special. For this recipe, you’ll need carrots, olive oil, honey, salt and pepper. That’s it! I like to buy bunches of small carrots with the tops on, they look so much more elegant and are sweeter than larger carrots. If you can’t find small carrots, it’s totally fine to use larger carrots that have been cut into sticks, it’ll still be delicious. I would not use those pre-cut baby carrots that come in bags for this recipe. I find that those carrots don’t have as much flavor as whole carrots. 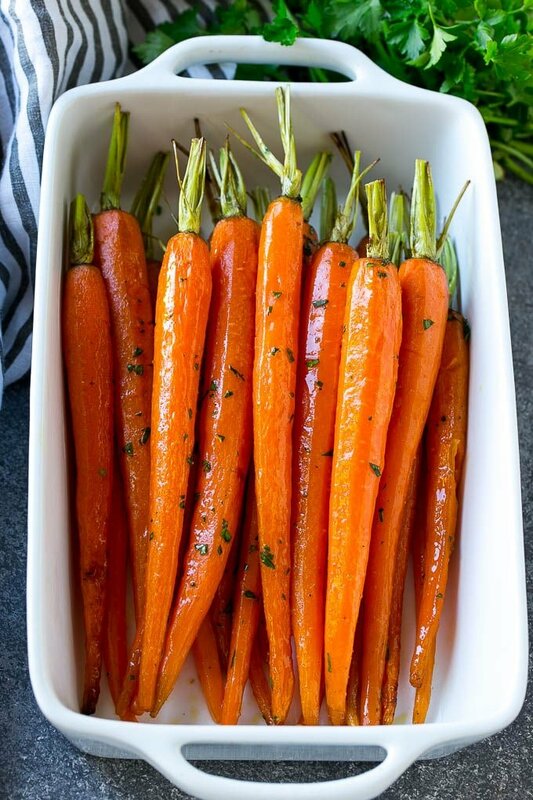 The carrots get lined up on a baking sheet and tossed with seasonings before they take a trip through the oven. Your bake time may vary depending on how thick your carrots are. 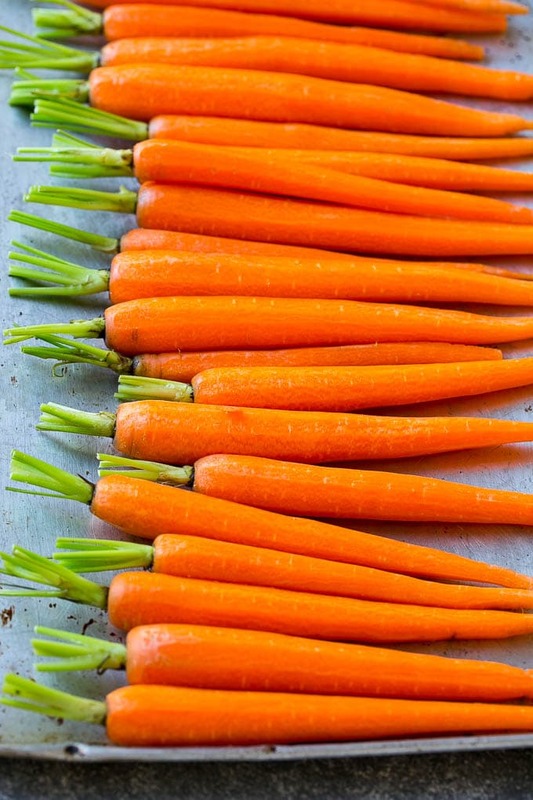 If you’re using carrots cut into sticks, those will also cook faster than whole carrots. While these honey roasted carrots are the perfect side dish to almost any meal, they’re also an easy and festive touch to holiday menus! I like to add a sprinkling of parsley as a finishing touch for these roasted carrots, but if you don’t have parsley on hand, it’s totally fine to skip this step. You could also try garnishing with other fresh herbs like thyme, chives or dill. 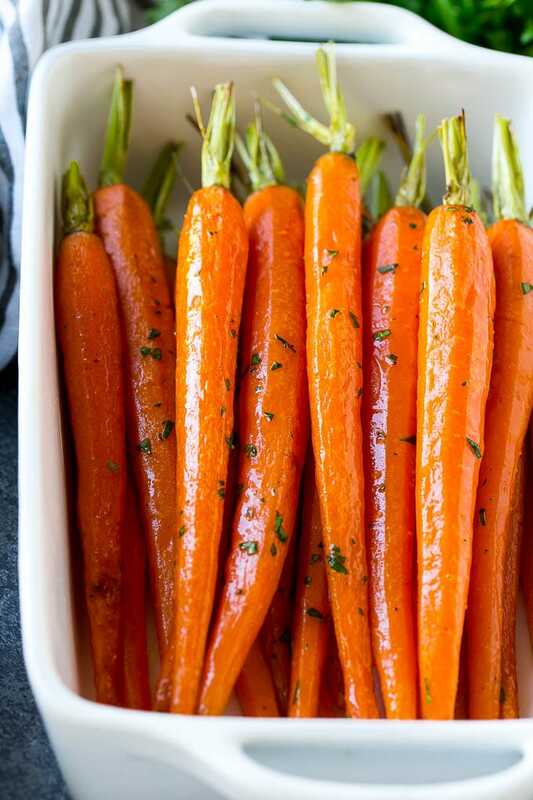 The next time you head to the grocery store, be sure to grab some carrots so that you try this recipe, it’s pretty much guaranteed to turn veggie haters into veggie lovers! In a small bowl, mix together the olive oil, honey, salt and pepper. Pour the honey mixture over the carrots and toss to coat. Place in the oven and bake for 25-35 minutes or until carrots are tender and browned. Roasting time may vary depending on the size of the carrots. Remove from the oven and serve immediately, sprinkled with parsley if desired. This post is sponsored by Buzz + Bloom Honey. Thank you for supporting the brands that make Dinner at the Zoo possible! This post was originally published on September 14, 2016 and was updated on April 17, 2018 with new content. The recipe says to serve immediately. Can the carrots be left out after cooking at room temperature ? For several hours. I have several casseroles to cook and one oven. I did these (2lbs) at 11 am and they sat out in casserole dish with the rest of my sides until i popped them all in oven to warm when prime rib came out of oven. They were fine ….actually awesome! I did 2 lbs for 7 people and there was a full on battle for the last carrot!! I was told by my family that 4 lbs would be good next time ! Lolol! These carrots are awesome! I’m so happy to hear they were such a hit, thanks for reporting back! I love these carrots too. Made at Christmas and I am making again tonight. Fresh thyme is a nice touch. You are right about baby carrots not working well for roasting. I added some baby carrots last time as experiment to see. Doesn’t even compare! Use only full size carrots! So happy to hear you enjoyed them, thanks for reporting back!! Would maple syrup work with these carrots? Yes, just use the same amount as you would honey! 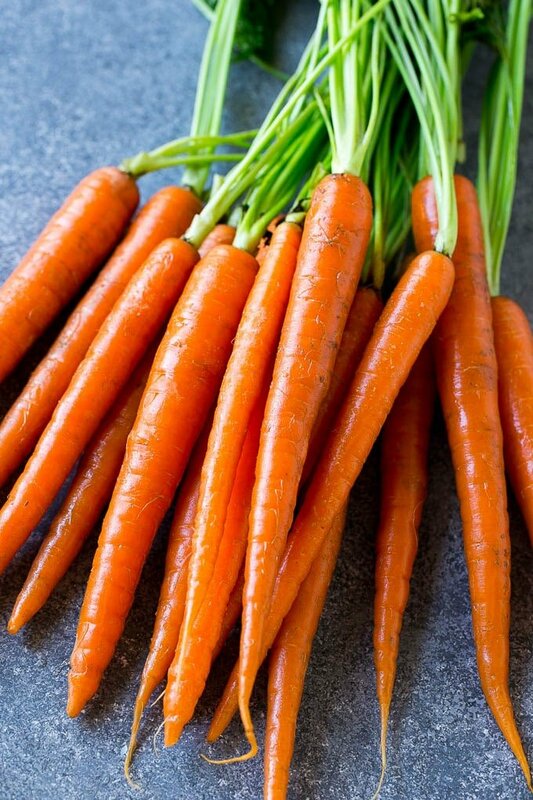 I haven’t ever been a huge fan of carrots, but received a pound of organic whole carrots from my CSA and followed your recipe exactly – they were delicious! The best carrots I’ve ever had. 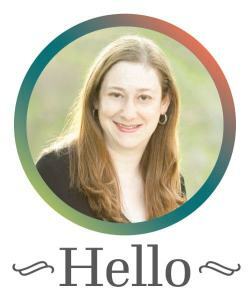 Saving this recipe – thank you!! Not only does this recipe sound amazing but your photos are stunning! 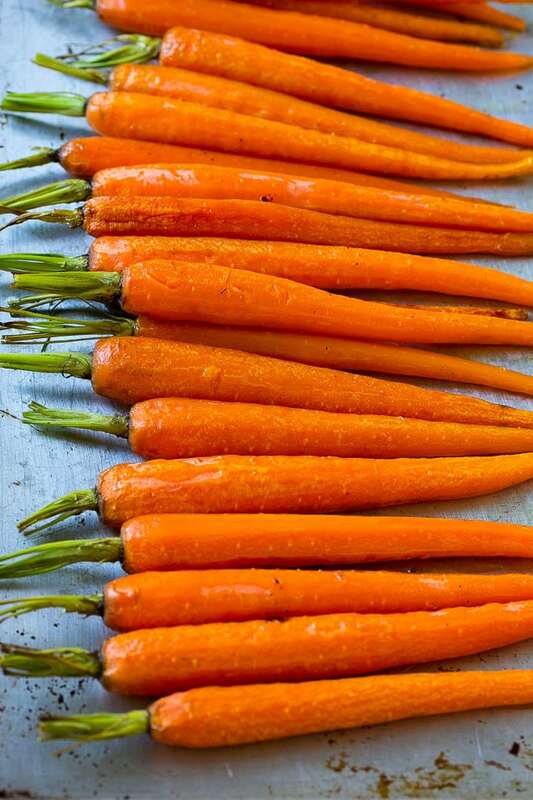 I am not usually a fan of carrots but these make me want them right now! LOL! Now these are some really great carrots! I would love to make these sometime. I have never had honey roasted carrots like this before. They look so good though! I always tend to make vegetables the same way for dinner and this would be a great way to change things up. I had no idea people honey roasted carrots! This is such a great idea and would more than likely get me to eat carrots more often. I am going to have to give this a try over the weekend. Those are gorgeous and it’s an easy recipe to make! I think it’s lovely especially when you pair it with steak or some porkchops. I’d love to make this when we’re having people over! I would have never thought to add honey to carrots. This looks so delicious and super simple to make. Would be the perfect side to start adding to our meals.